Self-serve frozen yogurt. This place rocks! Here’s why. You walk in, grab a cup (one of three sizes), fill it with as much or as little as you wish (of a plethora of flavors), add as many or as few toppings as you wish, and pay a mere .30 cents an ounce. Our total was just under $10 for three cups with toppings. That’s just a few bucks more than three single scoops at Baskin Robbins sans toppings, so I’d say it was definitely worth the trip and money. The funny thing about all this? 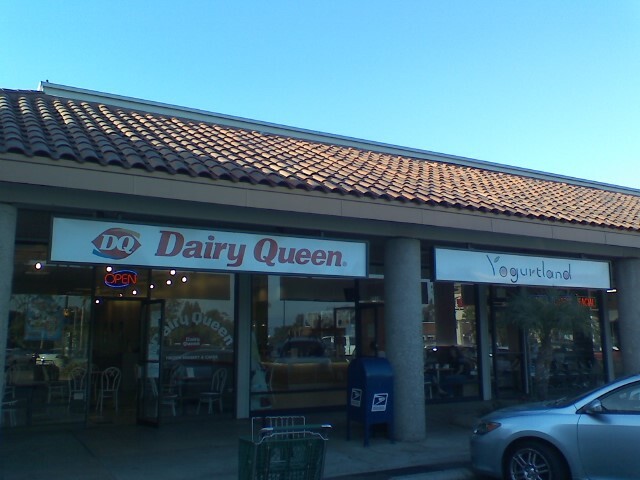 It’s next door to a Dairy Queen, which was totally empty. Watch out, Golden Spoon and 31 Flavors. You might be next! You might recall back in February that I was contemplating purchasing a new iPod Touch. Yesterday I did. Allow me to explain. No, I don’t absolutely need this. A hole in the head could provide more use in most cases. But given the situation, I think you might have bought one, too. After many purchases at Best Buy I was awarded $15 in Rewards Certificates the other day. That means that I spent umpteen dollars to get $15 back, but hey, the Best Buy card is paid off almost as soon as it’s used so there’s not a real concern over interest accruing. From there, it was a matter of where I wanted to buy it. Target was offering a $30 Gift Card with the purchase of the 8GB model while Best Buy offered a bundle for $307 that included headphones and a DLO Action Jacket. Considering Apple still insists on packing iPods with those regrettable excuses for earbuds and that I would probably buy a protective case for the thing anyhow, I opted for Best Buy’s offer (and earned more Rewards Points, too). I see this as killing two birds with one stone. Firstly, it’s my way of rewarding me on my weight loss progress. C’mon, 82 lbs. is twice as much as Valerie Bertinelli lost and I didn’t have to buy any silly foods. Secondly, my iPod Shuffle is, well, getting old. There’s only so long you can listen to the same 200+ songs during your daily walk, on the train, etc. And transferring songs to the thing is slow as hell, so this only made sense. It will be my Shuffle, not my 30GB, replacement. The final tally: $307 – $15 – $188 (on it’s way upon receiving of cell phones) = $104 out-of-pocket total. Okay, so I used a credit card to buy it while I await my FlipSwap check, but it’ll be paid in full once the bill and check arrive. All in all, not bad. And it’s a neat-o little gadget.